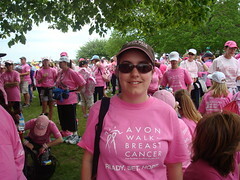 When I first signed up for the Avon Walk for Breast Cancer, it seemed like May 16th would never arrive. After all, it was January, and I was slipping and sliding my way through 3 mile walks, hardly comprehending that someday in the distant future, I would walk 26 miles in one day – and then 13 miles the following morning. May 16th arrived, and I found myself still unable to comprehend the magnitude of what I had taken on. Now, with a 22 mile training walk under my belt, I wasn’t worried about whether I would make the 39 miles. I was more worried about the other 1000+ people I would be walking with. I felt kind of small when faced with that thought. My arrival in Boston was rather inauspicious. I dragged my heavy backpack (which is almost bigger than I am) off the train, shouldered it, and set off walking from North Station – in the wrong direction. Map turned right side up, I retraced my steps and made my way up Bunker Hill, past the State House and through the Boston Common. “Going a long way?” a fellow hanging out on a street corner called after me. Buddy, you have no idea. 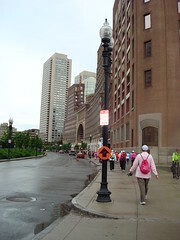 I arrived at the Boston Park Plaza Hotel out of breath and a little damp from the sprinkle of rain that had begun to fall. I was immensely relieved to find my fellow Mainer and walker, Linda, waiting in the lobby of the hotel. Once my backpack had been delivered to our room, I felt as though more than just it’s weight had left my shoulders. I was finally here. 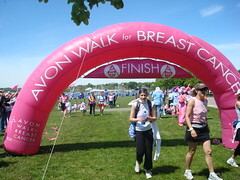 The Avon Walk was finally happening. It was all really and truly going to unfold before me. I was suddenly tremendously excited. I waltzed across the street to the Castle part of the hotel, where Event Eve registration was going on. Having gotten all my chores done online in the weeks before the walk, my registering took only moments. Then I was free to wander the “great hall” type room, check out the Reebok and Avon stores, and “people watch” to my heart’s content. Standing in line at the Avon booth to get myself an official Walk cap, I grinned to myself as I listened in on the conversations around me. Among the women in prefect make-up and diamond earrings, I stuck out a little, dressed in cut off jean shorts and my Reel Pizza Cinerama T-shirt. I didn’t care though, and I really don’t think anyone else did either. 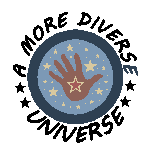 Regardless of where each of us came from, or what our stories were, I felt that we were all connected. “For 2 Days We Walk As One” is the catch-phrase of the Avon Walk for Breast Cancer, and that was the first time that I felt it was going to be true. After an interesting, but wet, wander down Boylston St. and through the Prudential Center with Linda, we returned to the hotel for dinner. Shaking the water off our coats, we promised each other that it wasn’t really going to rain on us the following day. We went to bed early, still optimistically disagreeing with the weather forecast – which called for morning showers – and set the alarm for 4:30a.m. May 17th, ten or twenty minutes later than the time the alarm had dutifully woken us to, found Linda and I stumbling round our room, trying to organize our backpacks and duffle bags, and figure out what to wear. Yes, it was raining, but the morning report promised clearing skies by midday. At 5:00a.m. midday seemed a long way off. We rode a shuttle bus to the UMass Boston campus, where the opening ceremony would take place. The drizzle didn’t really dampen my spirits, especially since there was breakfast waiting and upbeat hip-hop music blaring from the Avon stage. At 6:30 we all crowded around the stage – all 2900 of us, which we learned was a new record for the Boston Walk. Some inspiring stories were told by several breast cancer survivors, rules were gone over briefly, and a general overview of the Walk Weekend was presented, along with the dismal thought that we were currently at mile 0. Then at 7:00a.m., the route officially opened. Amid a huge roaring cheer, we shuffled off. 2900 people leaving a field and merging from a road to a sidewalk doesn’t leave much space to walk. For the first half hour I found myself trying not to trip over the four different pairs of heels directly in front of me. After the first “quick stop”, things began to spread out. I lost Linda for awhile, since I paused to fill my bottle with gatorade and my camel-pack with more water. When I started walking again there was more space on the sidewalk and my pace picked up. As we walked from UMass along Boston Harbor, vans with Avon Crew members drove past, honking and cheering. Other people who saw us honked and waved. I liked it the best when semi trucks or huge utility vehicles drove past and blew their whistles. Each time it happened, I was filled with pride, and another dose of excitement. The rain started to petter off as we came into downtown Boston, on Atlantic Ave. I caught up with Linda, and we passed the New England Aquarium, and took advantage of the Rest Stop at Christopher Columbus Park. We were at mile 5, I believe. From there we trooped on, passing North Station and then turning to go past the Museum of Science. As the clouds began to clear away and my coat dried and my bare legs warmed up, we walked along the Charles River, passing MIT and getting wonderful views of the Longfellow and Harvard Bridges. The quick stops and rest stops were very welcome sights, as they appeared every two or three miles. Each one had a different theme, and we were met with cheers and gifts of pins and necklaces and twizzlers. Whether it was at the Hawaii or the Western or the Lucky Irish rest stop, there were snacks and water and gatorade to be had. Another thing that quickly became a favorite with everyone was crossing major intersections. We had the help of a motorcycle club – a Harley club, no less – and at each difficult crossing we were met by a big burly fellow in black leather, who wasn’t afraid to jump out in traffic a clear the way for us. Their motorcycles were decorated with pink – anything pink they could find, it seemed – and fairly frequently there was a bright pink bra across the windshield. They were our traffic warden heroes! All morning I was excited for lunch, and it was not a disappointment. 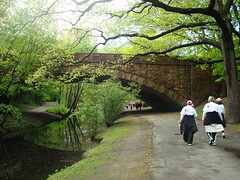 We ate at the Charles River Reservation, across from the Boston University campus, at mile 9. It was nice to sit down on the grass, already mostly dry, and stretch my legs. I didn’t take my shoes off though, like many others did. My feet were feeling good, and I didn’t want to risk them swelling and then not fitting back into my shoes! I left the Lunch stop before Linda, with her permission to march on. We crossed the Boston University Bridge and then made our way through the Riverway Park, which follows the course of the Muddy River out through Brookline. At mile 13, great cheers went up for all the folks who were walking the Half Marathon that day. I stopped to apply sunscreen and get some more gatorade. The sun was out in full force by then, just as promised, at midday. Jamaica Way, another lovely park that bordered a pretty piece of water, brought us out further into the Boston burbs. I was beginning to feel the distance in my legs at that point, but I was still moving really well and my pace was set. For a long while I kept up with some particularly fast walkers, and then passed them at a quick stop. Dedham wasn’t so pretty, but the miles were starting to get higher. Mile 16 passed, pink numbers on a white circle stapled to a telephone pole. Mile 18, mile 20. I was tired, but my pace didn’t start slacking until we entered Canton, and a long gradual downhill began making my knees twinge. It was genuinely hot, and my shorts kept sticking to my legs. I skipped a couple of quick stops, but then took a break at the “Horton Hears a Who” rest stop, which was at mile 24. I was going to hang out longer, but I was so close, and as soon as I stopped moving I was just itching to go on. I hit the road again, and soon reached the dreaded “uphill at the end” that I had been hearing about all day. To my surprise, my legs relished it, and my pace grew stronger again. I marched up that hill, waving cheerfully to the crew van that was driving back and forth, checking for people who had reached their limit. The space between mile 25 and mile 26 was mysteriously long. I suspect the distance was more than a mile, but it would have been less fun to see that glorious “Mile 26” sign, and then a “+ .2” sign right after it. Instead, mile 26 glowed pleasantly beneath 4 o’clock sun at the gate of the Prowse Farm, temporary home of the Avon Wellness Village. As bystanders cheered me on, I walked up the driveway and through the pink arch. Then I wandered for awhile in an odd sort of daze, unable to stop moving. I had done the 26 miles in about 9 hours, and I kept thinking vaguely, “I’m officially a long distance athlete now.” It sounded impressive, but I was too tired to be very impressed. At the same time, I knew I had a silly little grin on my face – similar to the one I saw on faces around me. We had all made it, and it was amazing and thrilling, and…now what? Eventually I gathered my thoughts enough to stumble across the huge field to where Tent City was being erected. I found my tent site – E57 – marked by a flimsy little flag, and stood uncertainly in the square of long grass, looking round at the other walker/campers who were making variously talented efforts at putting their tents up. “You look lost,” said someone from behind me. A very agreeable looking fellow was standing there with a blue tent in his hands, the word “CREW” written across his T-shirt, and helpfulness radiating from him. It was a plan – and just what I needed to get my brain turning again. A trip across the field to the Budget Moving truck marked with a giant E, produced my backpack and Linda’s duffle. Fifteen minutes later, tent set up and contents of backpack strewn round comfortably, I headed for the shower. That done, I marched over to the yoga tent and proceeded to take several naps throughout the course of an hour long stretching and relaxation class. Linda arrived at the Wellness Village around 5, and I discovered her in our tent inspecting her blisters. We chatted for a moment about our awesome endeavor, and then I trotted off to get a seat in one of the electric massage chairs. Then, just because I could, I went to the medical tent to have my one tiny little blister attended to, immensely grateful for the good socks and shoes that had saved me from the more substantial blisters I saw around me. I ate dinner outside, relishing the evening sunlight, and then entered the huge dining tent to watch the evening entertainment. A little music, some games, and a great deal of cheering for the team who had raised the most money, the oldest walker, the walker from farthest away, etc. followed. 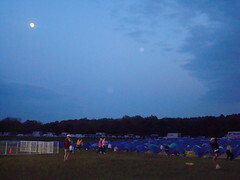 I strolled back to our tent as the moon rose and the light got purple around me. I made some phone calls, and then curled up in my sleeping bag. Following Linda’s queue, I prepared to read for a awhile, but put my book aside almost immediately, and, as Linda told me later, fell asleep as soon as my head hit the pillow. The next morning I was awakened by the sunlight, around 5:00a.m. I listened to the sounds of the people around us waking and rising. There was a touch of excitement lining almost everyone’s voices. Linda and I sleepily inquired after each other’s blisters and aches, and then muddled about in the tent trying to dress and pack at the same time. It was already warm outside, and I quickly decided not to carry the fleece and raincoat I had toted around the day before. All around us tents were coming down, about as efficiently as they had gone up, which is to say, “not very”. I got a kick out of watching, but again that feeling of companionship hung about in the air, and I was filled with a strong sense of belonging. All 2900 of us walkers were here, embracing this experience together. Linda and I took our tent down and got rid of our heavy bags. She headed for the medical tent once more, and I went to devour some breakfast. 7:30a.m. arrived sooner than I had expected, and I was still filling bottle and camel-pack with water and gatorade when the route opened. As the first wave of people left, I watched from the line to the porta-potties. Soon enough, though, I was ready. I bid farewell to Linda, leaving her in that same seemingly endless bathroom line, and began the second leg of the Avon Walk. The first couple miles of the route were congested. We moseyed down the side of a shady road, being shooed to the edge by our favorite motorcyclists. 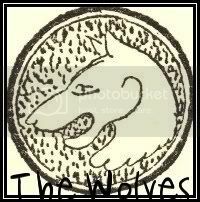 I grinned to myself, watching a few industrious souls speedwalk past, arms swinging vigorously. My own pace settled quickly into something that felt very comfortable and relaxed. It wasn’t slow however. By mile four I was passing those same people who had zipped by me earlier. 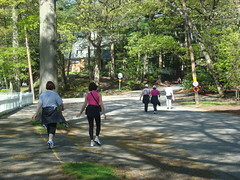 The route meandered variously through neighborhoods with large houses and huge trees, and through the downtown area of suburban towns. Spaced out every two or three miles were more rest stops, with people to cheer us on. The sun shone brightly down, but it never got too hot. I reached the lunch stop, and mile 8, by 9:30a.m. I was walking about 4 miles an hour, and I felt good and strong. My excitement was mounting, and I almost didn’t want to stop – especially since I had eaten breakfast only a little over two hours ago. However, I couldn’t resist the idea of a chicken and veggie wrap, and a large double chocolate cookie! By mile 12 I could see the UMass campus, red brick buildings glowing in the sun, sitting across an inlet of Dorchester Bay. The hardest part of the entire second day of the Avon Walk was walking up the street, passing, passing, passing the UMass campus, and then crossing the road and walking all the way back around the corner of the waterway, and around the bend of the land to the other side of the campus. That part – the last mile – seemed endless. Finally though, I found myself walking down an aisle between cheering people, and that same upbeat pop-music that had graced the morning before came blaring out of speakers toward me. A pink arch with the beautiful word “Finish” printed across it, rose before me. Nonchalantly, I walked though. And then…it was done. The accomplishment had been achieved. 39 miles. A marathon and a half. Completed. It was ll:30a.m. Again, I wandered in a half daze through the collection of walkers and their families, lost for a minute. 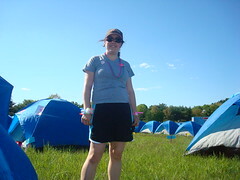 The food tent brought me back to myself, and I picked up some snacks, then collected my official Avon Walk Boston 2008 T-shirt. I found a sunny spot near a tree with a lovely view of the water, and camped out. It would be another 3 hours or so before the closing ceremonies began, and there were a whole lot of walkers left to finish. I called Linda and found out that she was at the lunch stop, so I had time to rest my feet before I went to cheer her in. I napped and ate my snacks and napped and finally got up to go collect my backpack and get my stuff organized. Around 1:30p.m. I returned to the finish line and watched the walkers come in for awhile. By then there was a solid line of people waiting to go through the arch, and more and more family members and friends were arriving to cheer them on. I missed Linda’s entrance somehow, but I found her with her family shortly after, and we cheered the motorcycle crew around the bend to the finish line together. Things were coming to a head, and soon enough someone was announcing over the sound system that the walkers needed to get themselves collected over by the medical tent, in preparation for the closing ceremony. The official T-shirts were being donned all round, and it looked like a pink wave had crashed over us all, leaving pink puddles behind. 2:45 arrived, and the announcer declared that all the walkers had finished (much cheering followed) and that the closing ceremony would begin shortly. Next thing I knew, crew members were sorting us out, and then we were marching across the field toward the stage, amid a tremendous tumult of cheering and inspiring music. The Walkers crowded to the right and left of the stage, and then the walkers who were also breast cancer survivors marched in together, and the tears started springing to everyone’s eyes – good tears, very, very proud tears. Then the crew marched in, and the cheering got quite ecstatic – for, if we walkers were our families heroes, the crew were our heroes. They had cared for us and protected us and made the entire walk go so smoothly. As the last participants in the Walk filed in, the music from Remember the Titans that has become synonymous with triumph and achievement (at least in my mind) rolled out of the speakers, and an overwhelming thrill went through me. The rest of the ceremony was a blur, loud with cheering and clapping as the money we had raised was given to worth recipients – including a program in Lewiston, ME, which made Linda and I cheer extra! – and then we were all holding hands that were lifted above our heads, connected once again and this time physically, as more inspiring music played and the words, “For 2 Days We Walk As One” flashed across the stage. With that, the Avon Walk for Breast Cancer Boston 2008 was officially over. Tired and happy, Linda and her family and I headed for their car, and then endured an endless line of traffic leaving the campus, 15 minutes of being lost in Boston, and then a 2 hour ride back to Maine. They dropped me off in Wells, fond farewells were made, and then I drove from the train station back to my parents house. Everything from the moment the closing ceremony ended until I went to bed that night seemed totally unreal. I just passed through it, watching curiously as life continued to unfold before me, knowing that somehow I had been profoundly changed and that the world looked different. Unable, though, to fully comprehend. It wasn’t until the next morning, when I was doing chores around town and ran into my old bank to close accounts, that the world popped back into focus. The teller went about her job quickly and pleasantly, talking quietly to the young man behind her who was in training. I stared sleepily at this and that, took my money, and prepared to leave. “Did you do the Avon Walk?” the teller said as I was gathering up my things. I started, glanced down at my bright pink Avon Walk shirt, and then looked up, something rather like a beaming smile on my face. She thanked me, and I turned away, ready to both burst into tears and go skipping and cheering to my car. Once in my car, I drew a long deep breath, and let it out slowly. I felt more awake than I had in a long time, more ready to take on the next challenge, more willing to smile at random strangers, more excited to live, to be alive, making small differences for the better in the world around me. I felt ready to keep on walking. 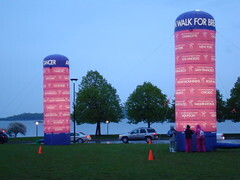 Avon Walk for Breast Cancer Boston 2009, anybody? Just found your blog. I was there, too. What an AMAZING experience! I walked. My husband and son were on crew (tent and gear). It’s possible my son set up your tent. Will we be there for 2009? ABSOLUTELY! We’ve already registered. Hope to see you on route! In the meantime, thank you for the excellent job you’ve done telling the Walk’s story.